Aerogel particles are available in a variety of different particle size ranges. But which product is right for your application? Select the statement below that most closely matches your need to determine which particle product will work best for you. If you are new to aerogel and are interested in experimenting with aerogel particles, we recommend trying Lumira® LA1000 aerogel particles first. Lumira aerogel consists of millimeter-diameter hydrophobic (water-repelling) translucent particles and is a great way to experience aerogel first hand without spending a lot of money. Other aerogel particle products are meant as performance additives for paints and coatings and are significantly more difficult to handle if you are inexperienced with handling fine powder additives. If you are interested in preparing an aerogel-enhanced coating, however, we would recommend Enova IC3100, IC3110, or IC3120 fine aerogel particles as recommended for the applications below. If you are not accustomed to coatings development, Enova IC3120 aerogel particles would be a good product to start with. 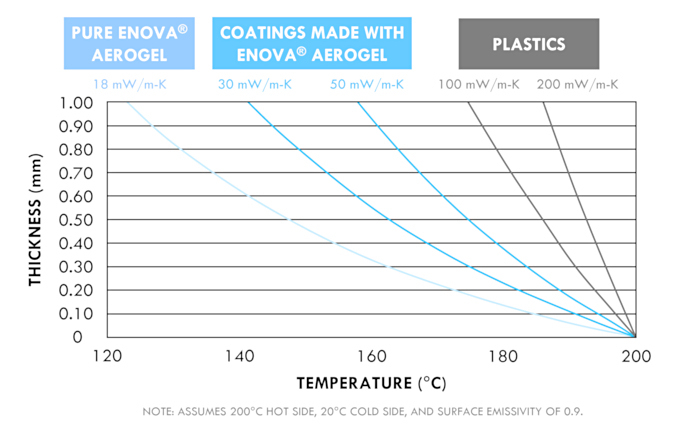 If smoothness, reducing gloss, and rheology control are important, Enova IC3100 aerogel particles and Enova IC3110 aerogel particles may be better suited, depending on the coatings formulation. For reducing gloss, Enova IC3100 aerogel particles are an excellent choice. Enova IC3100 blends the easiest of the three Enova grades and gives a smooth finish. An alternative that will provide improved thermal insulative performance would be Enova IC3110 aerogel particles however will give a rougher finish. For daylighting and other architectural applications involving light transmissive panels, choose Lumira® LA1000 aerogel particles. LA1000 consists of millimeter-diameter particles engineered to minimize self-abrasion and settling, useful in filling aerogel particles between transparent panels for fenestration applications.